It had been 21 years since I had ventured into Knoydart. 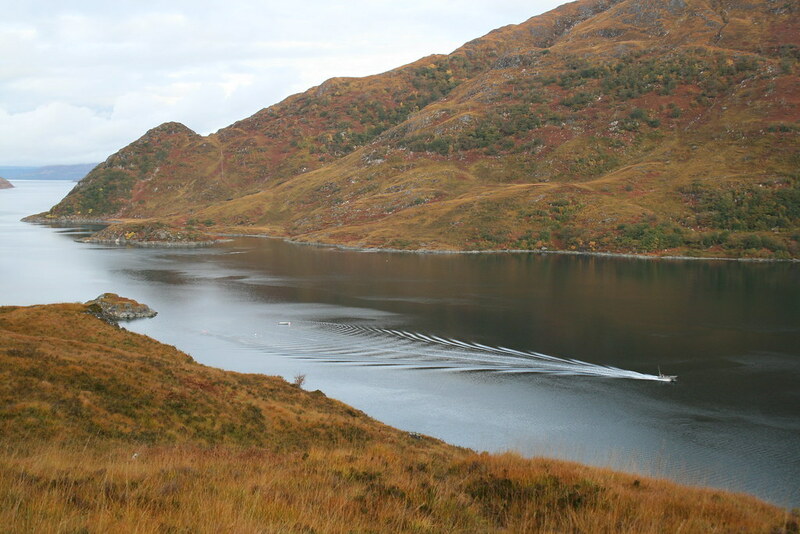 Then I went in twice within a 6 week period, both times from Kinloch Hourn, in the final push towards my compleation. 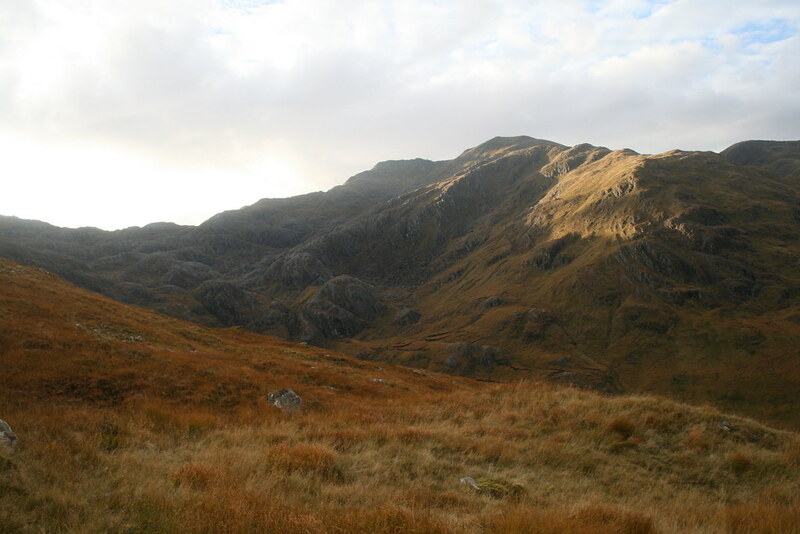 On each occasion we had arrived at Kinloch Hourn late, having left work in Yorkshire the same day, and walked in along the coastal path largely in the dark. But being late spring and the weather settled I remembered the walk in as being delightful, though punctuated by two or three unwelcome climbs to avoid headlands. 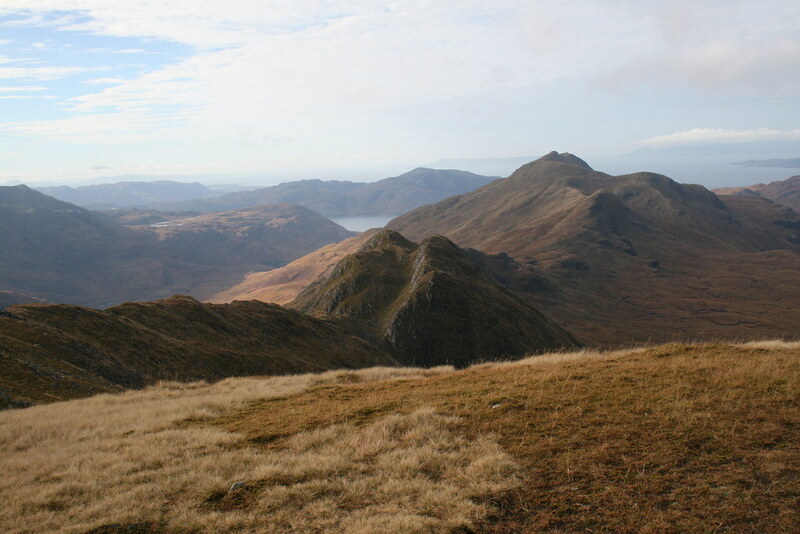 Knoydart is one of the more remote areas of Scotland, a peninsular on the west coast with access only by boat or on foot. 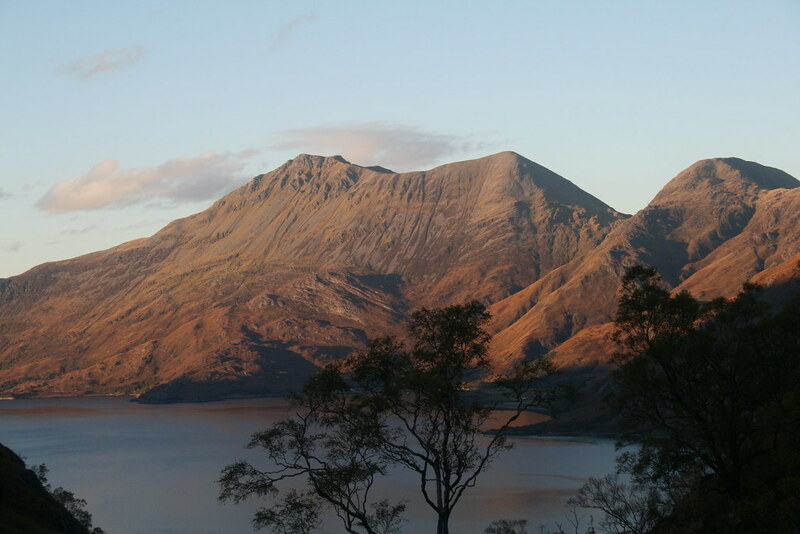 It is now largely under community ownership through the Knoydart Foundation with another significant part owned by the John Muir Trust. 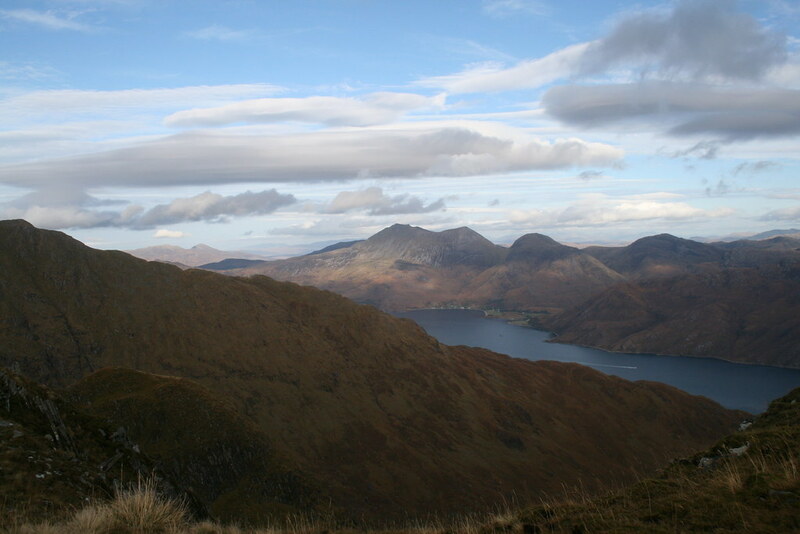 It is sandwiched between two sea lochs – Loch Nevis and Loch Hourn. These can be translated into English as Loch Heaven and Loch Hell! So it was to the autumn of 2012 and I had been awaiting a decent forecast before making the long trip north for the long awaited return. I had considered approaching via Mallaig and Inverie but ultimately settled on Kinloch Hourn again. 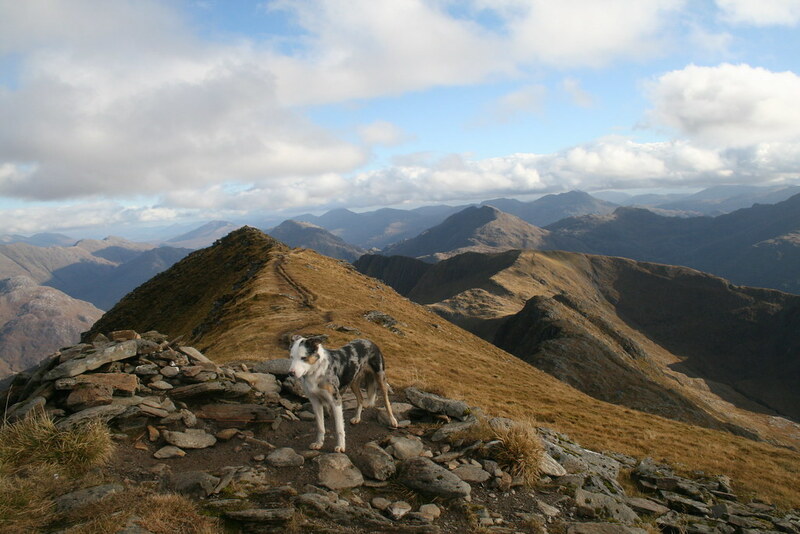 The MWIS forecast for the Saturday and Sunday predicted 50% and 70% cloud free summits respectively. That was enough to persuade me. Leaving home early Friday afternoon I was accompanied by Jet – the only family member who willingly accompanies me into the hills. I caught up with the rain in the Southern Uplands and had it off and on for the rest of the journey. 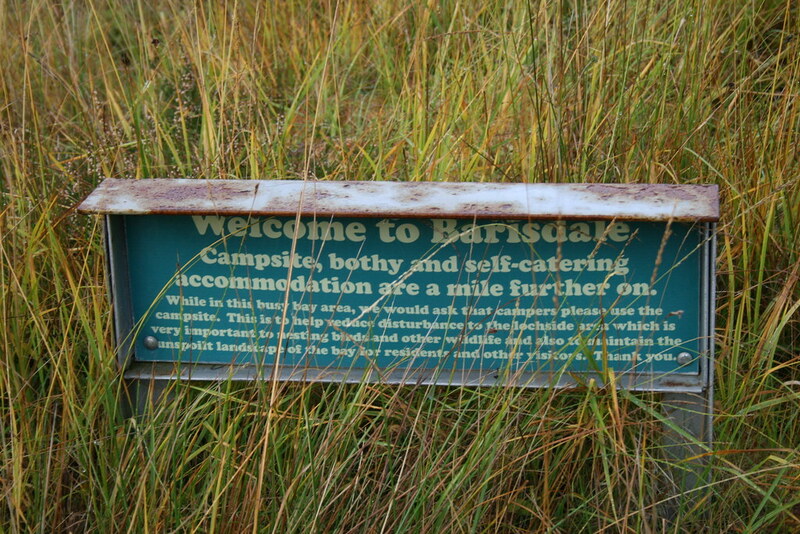 Original intentions to walk in to Barisdale that evening were dampened by the weather and the fact that I was still suffering from the after effects of man flu. So I parked up about 3 miles short of Kinloch Hourn to hunker down for the night. My decision not to do the walk in then was, I felt, justified listening to the rain drumming on the roof of the car. I awoke early. 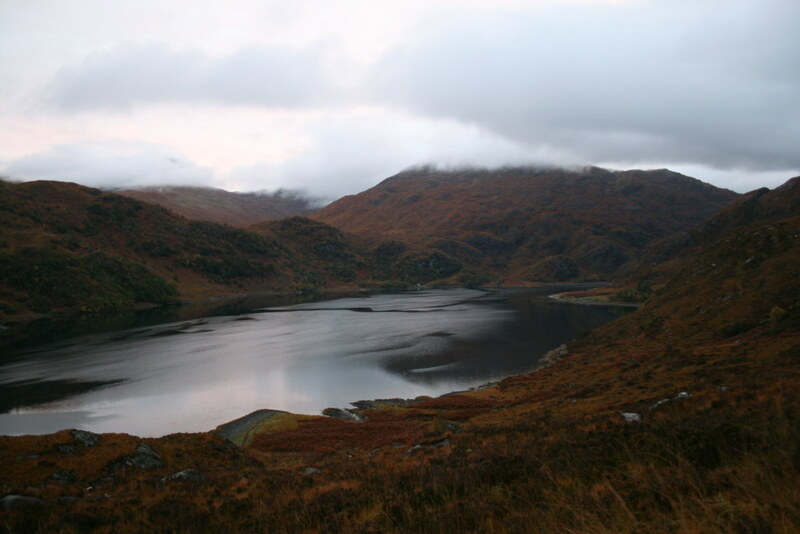 The rain had stopped but it was still dark as I drove the final miles to Kinloch Hourn. 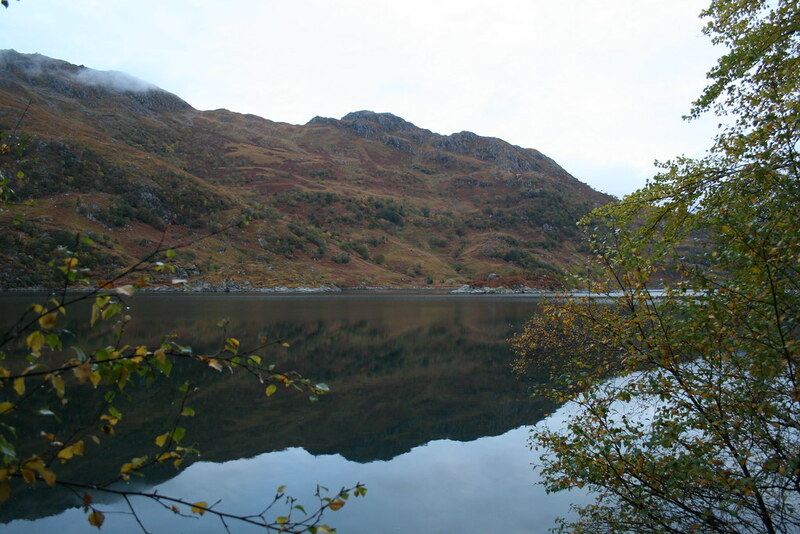 Kinloch Hourn is a small settlement comprising a farmstead, a couple of houses and a lodge. Kinloch translated as “Head of the Loch” so I would be starting from the Head of Loch Hell – not a portend of things to come I hoped. There are two car parks provided by the farmer there, both on the left as you arrive. The first described as a “winter car park” was where I parked, slightly raised and partially fenced. The “summer car park” is a couple of hundred metres further on and just comprises an open slightly boggy area adjacent to the road, probably formerly a bog that had been infilled. . There were four or five other vehicles parked up. A sign invites a £1 per night contribution for parking. I decided that arriving at 6.30am did not count as a night for these purposes. Jet and I were off by 6.45am. I planned to walk as far as the bothy at Barisdale and have breakfast there. For the first ¾k you walk to the end of the road. There the coastal path begins. It hugs the water’s edge to start with, on occasion built from large blocks and supported with parapet like structures. Ropes lying on the ground disappeared towards the water indicating the presence of unseen jetties. The air was still and above a star occasionally appeared between breaks in the cloud. Jet disappeared ahead into the blackness. The call of wildfowl drifted across the water. The beam from the head torch lit just a small part of the path ahead. From time to time Jet would come back to check that I was still coming. A section of rhododendron was wetting. 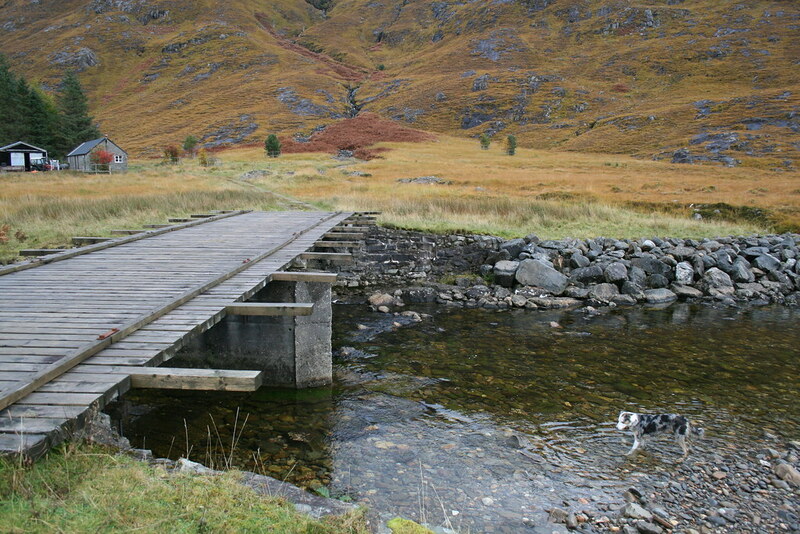 There is a rise to a bridge across a large stream by Skiary. After the previous day’s rain, the stream was thundering through the little gorge by the bridge. Skiary was once a large settlement based on agriculture and fishing. It even once had a school. Now it just comprises a single house with associated buildings. The path dropped back towards the Loch briefly. The path was surprisingly overgrown. My legs were soon wet from the grasses and bracken. I ended up walking with my poles ahead of me trying to knock the water off the vegetation before I passed. Beyond Skiary, which I did not see, there was then the first major rise in the path to avoid a rocky section of shoreline. The path gains about 100m in height before it then descends more steeply to Runival. Both Skiary and Runival are two lonely cottages, the former now operated as an occasional guesthouse. Slowly the sky behind began to lighten. 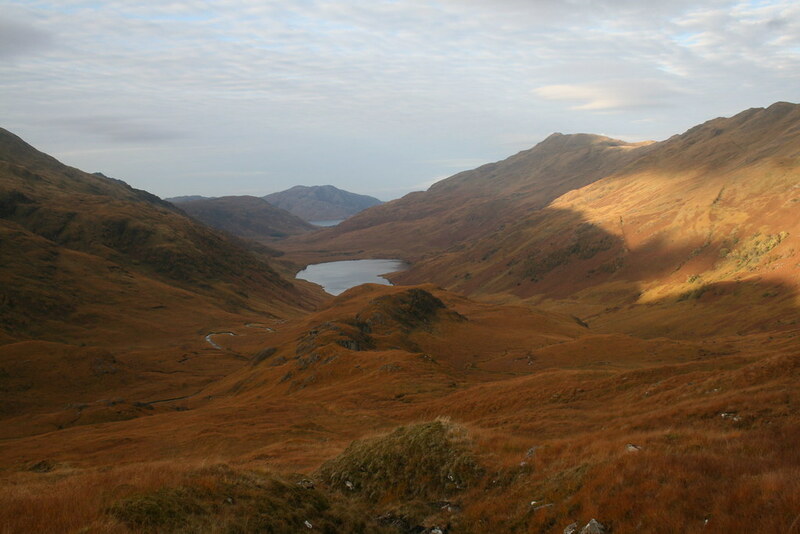 The sounds of the rutting season, which eventually became ever present throughout my journey, boomed across the Loch. A solitary stag trotted past Runival. By 7.45am it was light enough to walk without the aid of the head torch. Immediately after Runival the path again makes an unwelcome climb up to the 100m contour line in order to by-pass another headland, Rubha Raonobhal. This felt the toughest of the climbs before the path then descended again to the Loch. The walk along this section was, I thought, the prettiest section of the path. The waters were still and clear. Rocks and sea vegetation could clearly be seen beneath the surface. 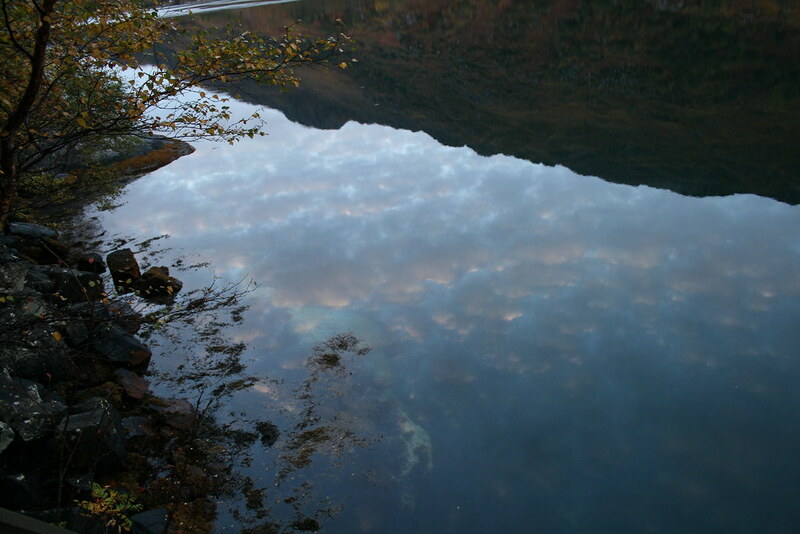 Autumnal colours reflected in the slight ripples. 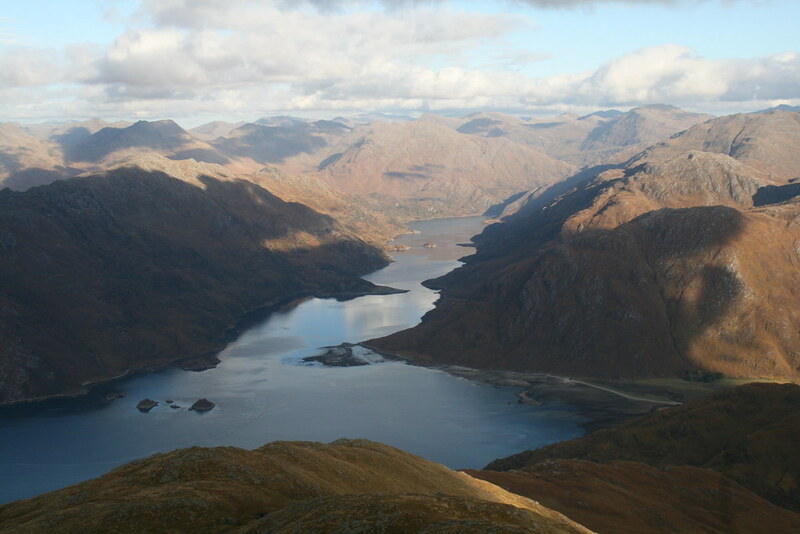 The inner reaches of Loch Hourn began to open out. Across the Loch there were more remote cottages and sounds of the rut continued to float across. I stopped briefly at what seemed to be a relatively new bridge to wonder at the sights and sounds. It is here that the horn of Stob a’Choire Odhair first came into view. 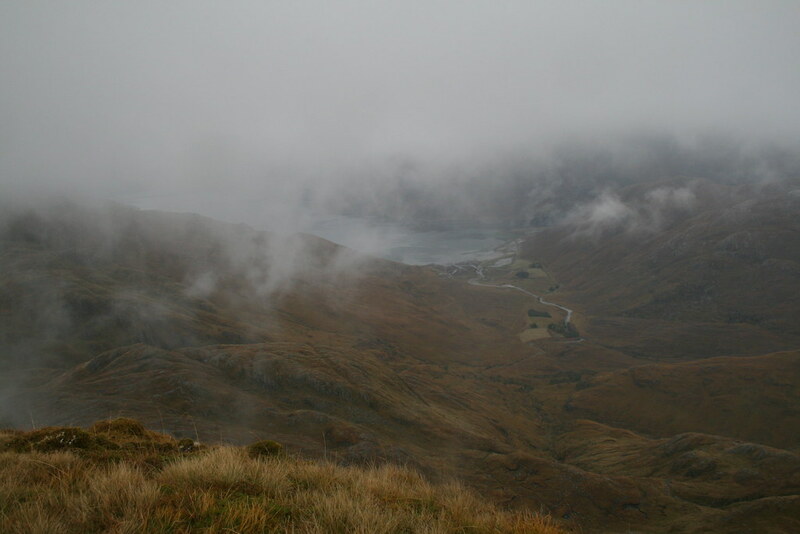 There followed a final climb cutting over to Barrisdale Bay. Once the rise was breasted more of Stob a’Choire Odhair came into view. Clouds drifted lazily around the tops. 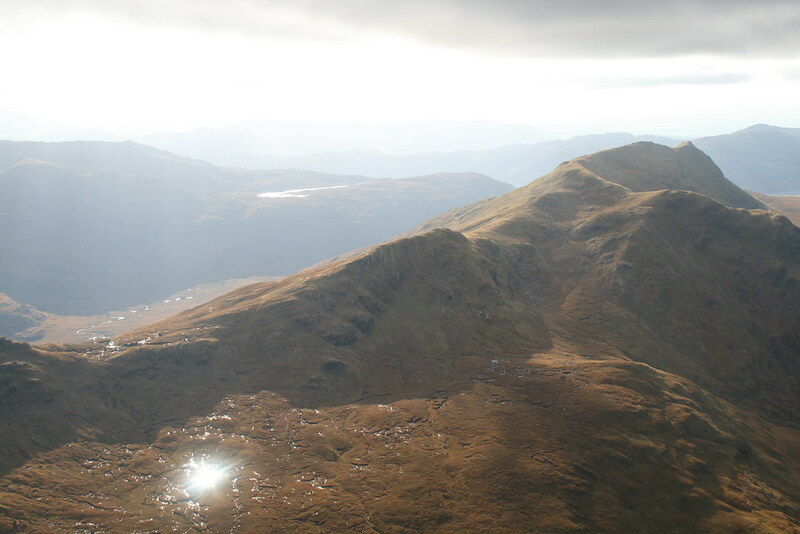 To the west, Beinn Sgritheall was still covered. The path, despite recent rain, was not too bad. There were the occasional squelchy sections but these were overcome with care, including some rock teetering with the heavy pack on the back. A small boat made its way through the narrows separating the dark upper part of the Loch from the broad open seaward part. The path then descended gently to the top of the final straight drop to the northern end of the Bay passing over a well constructed buttress to the path. The final drop brought me past the ruined church with its substantial walls, but roofless. Here the vehicle track around Barrisdale Bay was met. A sign welcomes visitors. It was low tide and ahead Eilean Coinnich was joined to the mainland by a spit, only accessible at low tide. 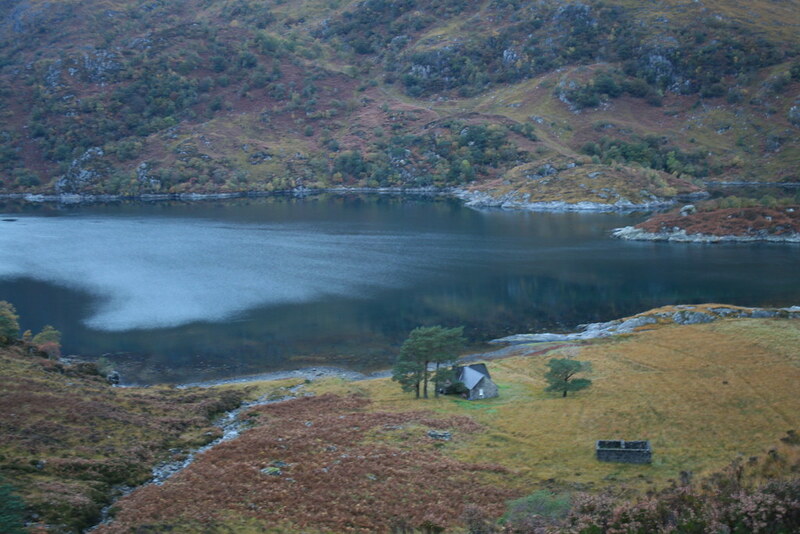 This island was the burial place for the Barisdale settlement and perhaps the smaller settlements on either side of Loch Hourn. 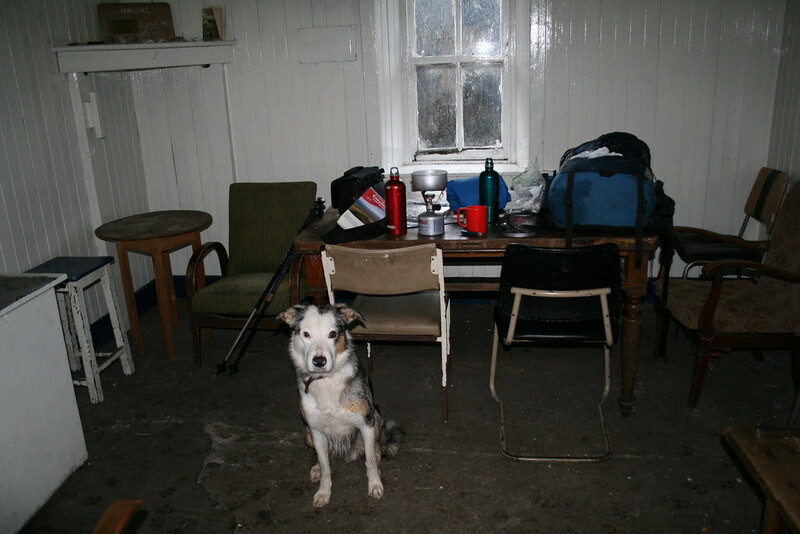 It was an easy mile or so to the Bothy where I unloaded my pack. Just before the Bothy is a stalker’s house. The stalker’s wife was in the garden and we waved to each other, her dog barking a warning. 500m before that is the Estate Lodge which was quiet but probably occupied because windows were open. We had our late breakfast in the Bothy. It was 10.10am. The time taken to get there was longer than I had anticipated or remembered from my previous visit. Still it is over 10k of distance and almost 600m of climbing; I felt as though I had already done a full day’s walking. 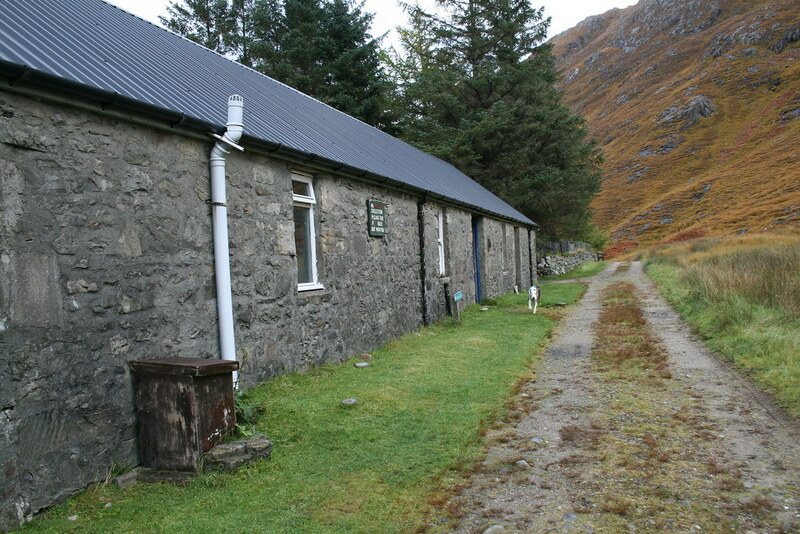 It is a private Bothy and a £3 per person per night charge is required. There is a box by the sink to deposit cash, or cheques can be sent and an address is provided. There are 12 bunks in other rooms plus a toilet. The fire place has been boxed in and is not usable due, apparently, to past misuse. I gave the dog his breakfast and lit up the stove. I had porridge, tea and a monster flapjack. We mooched around for about 45 minutes. Time was pressing and we had to leave. The track carried on to a substantial bridge over the River Barrisdale. On the right there comes the path from the stalker’s path which leads to Coire Dhorrcail and Ladhar Bheinn. It continues past the branch to the White House and, shortly after it stops, another path branches south towards Gleann Unndalain which provides an alternative approach to Luinne Bheinn. We followed the Mam Barrisdale path though. It is well made and at a pleasant gradient. 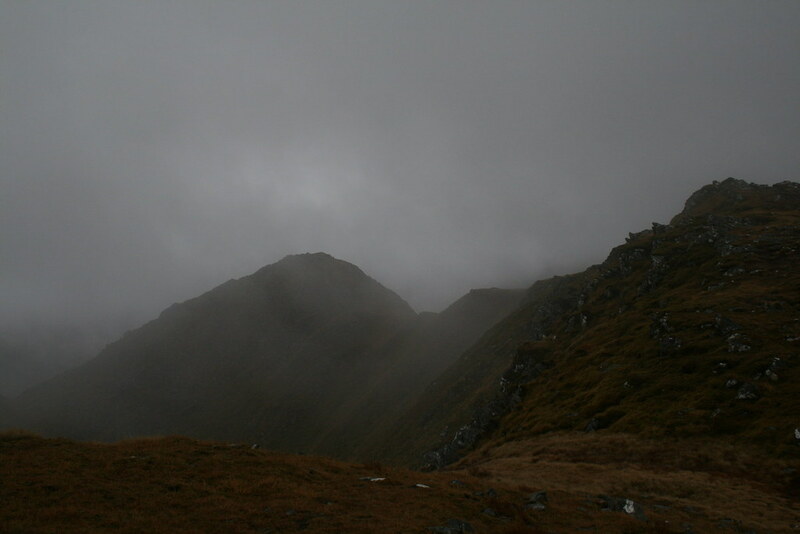 Height was gained quite quickly and the cairn at the head of the pass was reached. We had another stop here. 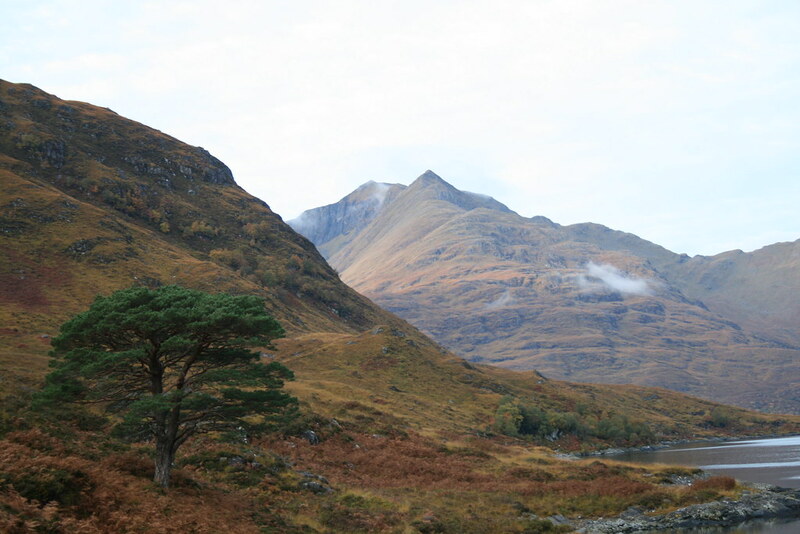 I had considered camping at this spot and doing the round of Luinne Bheinn and Meall Bhuidhe with a lighter pack. But I decided that was too committing. From the pass a boggy path leads off a round a few humps towards Luinne Bheinn. It is probably best to break off from this path sooner rather than later and head towards the incipient ridge. But I carried on along the path which follows a line of fence posts. Eventually I was overlooking Bealach a’Choire Odhair. 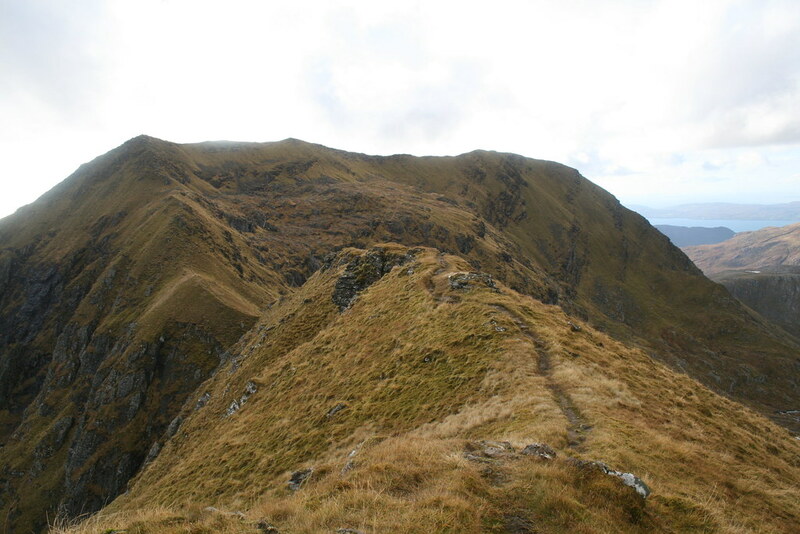 At this point I turned north up a wide re-entrant to find the west ridge at about the 900m mark. On hitting the ridge I looked back the way I had come and saw a pair of walkers far below at the Bealach Choire Odhair, the only other people I would see that day. Unfortunately the cloud showed every likelihood of descending. 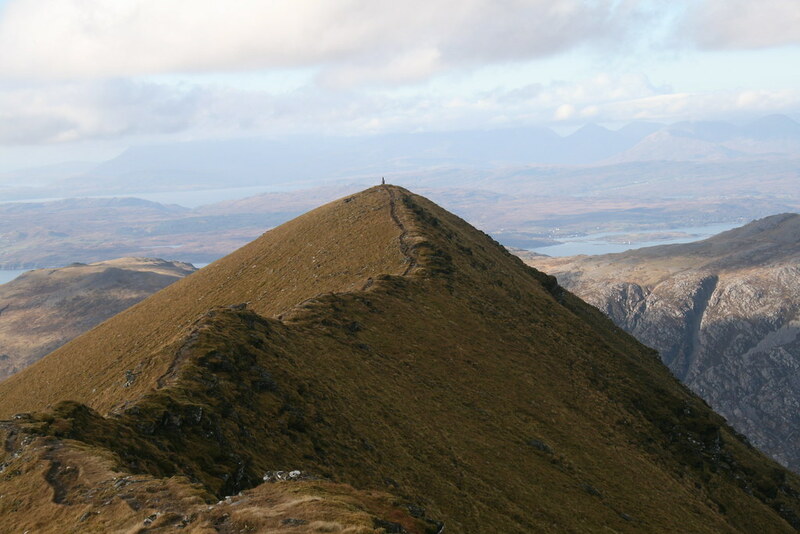 Luinne Bheinn has three spot heights shown on the Harveys and OS maps. 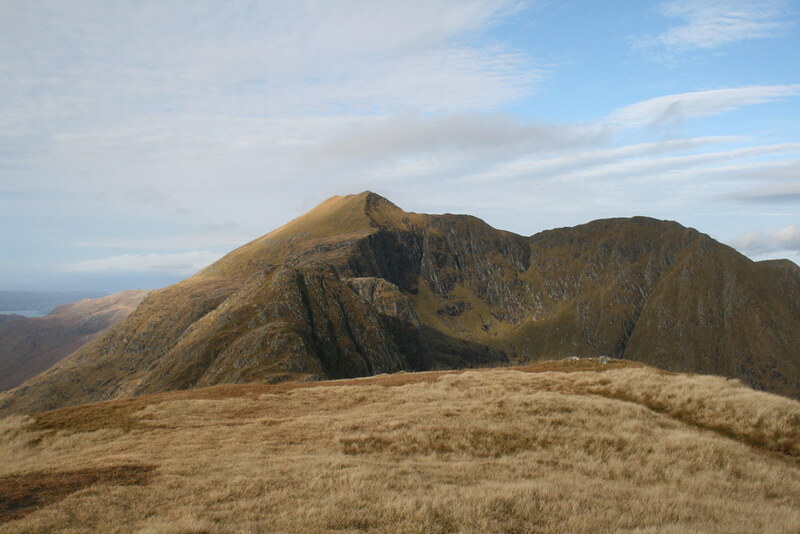 The first from which the second photo below is taken has a cairn but is not within any contour ring and so there is no drop between it and the Munro summit that is only a metre higher and 150m further on. The top was now covered in cloud and we did not stay. It was 2.20pm. The route was then down and up on to the Munro top another 300m on before swinging south east to descend to the Bealach Choire Odhair. 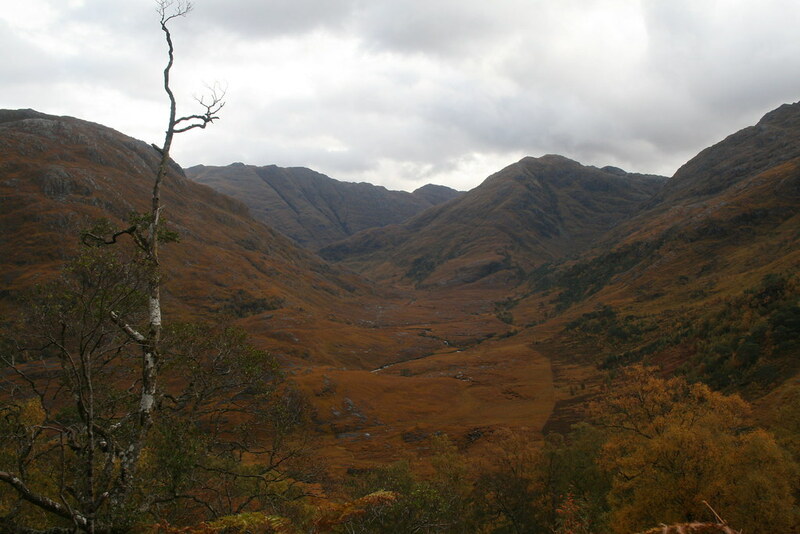 There is a drop of over 200m in height to the Bealach. I was feeling quite tired by now. There was a hill between us and Meall Buidhe. The path skirts around its higher reaches and it had started to rain quite heavily. I ground my way on but half way up I had to stop again to refuel. There was no shelter to be had and I felt damp and a bit miserable, indeed cross with the forecast that had not predicted any rain. The food together with a supply of Jelly Babies in my hand was enough to regain some impetus and we rounded the top of Druim Leac a’Shith before descending to the next Bealach at 710m. 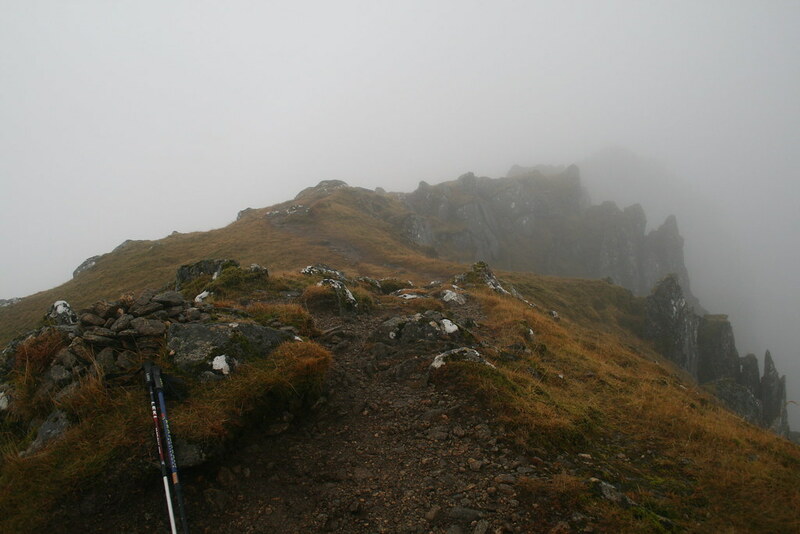 I must have ascended the final climb to Meall Buidhe in a bit of a daze because I do not remember much of it. I was probably too tired. I was looking forward to creeping into my sleeping bag! Jet found a suitable spot for a paddle. First the east top and then the main summit were reached. It stopped raining and a break in the clouds allowed me to see a red line of the setting sun between two layers of cloud. I would now look for somewhere to pitch the tent. It was 5.15pm. In Scotland in October it would soon be dark. I went north. The north ridge is not clear at first but soon forms. After a couple of hundred metres of walking I came across a long thin lochan. I considered stopping here but it was a bit exposed to the elements and there was no running water. So I carried on trending to the right into the part of the coire marked as Coireachan Leacach, I did manage after 20 minutes or so to find a fairly level patch of ground that was not also a bog. In fact it was quite a nice site sheltered on two sides by rocks and with a streamlet nearby. It was somewhere around the 450m contour mark. 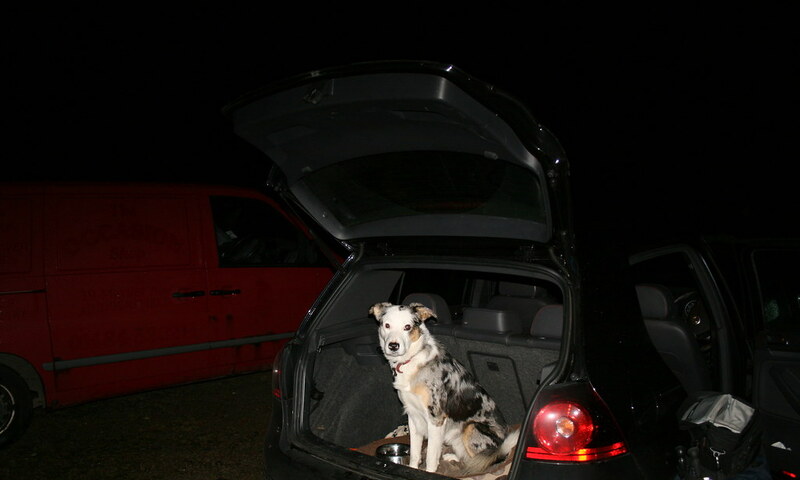 Jet watched curiously as I set up the tent and sorted out what was needed from my sack from what I did not need. The tent was soon up and it was as well because just as we had sorted ourselves out, it began to rain again – this time with some intensity. It was a bit of a squeeze in the tent, which is a one man tent. I fed Jet whilst organising the evening meal. Once he had finished eating he dutifully curled up and started cleaning his mucky legs and underside. My pasta was soon on the boil but I had to open my sachet of Lloyd Grossman tomato and basil sauce. The “cut here” corner of the package really needed scissors or a sharp knife, neither of which I was carrying. So I fought with the packaging using nails and teeth to no avail. Next I pinned it to the ground and pushed my fork into the corner. Eventually four holes appeared and a bit more stabbing and wiggling with the fork fashioned an opening. The pasta was ready and I drained the water. The sauce now needed to be added. A bit of pressure on the packaging led to a dribble of sauce emerging. I thought to myself that this was not much good. So I grabbed the packaging with both hands and squeezed it hard. Mmm, mistake. It exploded and soon I was surrounded by a scene that could have come from the Texas Chainsaw Massacre. Bits of pasta sauce splattered the ground around the stove and were dripping of the inside of the fly. Fortunately the only bits of me that were hit were my hands. I got what was left into the pan and get on with things. Jet remained blissfully unaware. The sauce heated up, I was able to eat the meal, finished off by a mug of tea and dunked Digestives. As I was tidying up, Jet decided to investigate and was delighted to find titbits of food to hunt down. The ground around and the inside of the tent were thoroughly licked clean! We were settled down and fell asleep to the drumming rain shortly after 8pm. As usual for me in a tent, sleep during the night was broken. Occasional strong blasts of wind shook the tent, it was fairly chilly and my mouth was dry – I was dehydrated. I finally woke up at around 6.30am. Outside it was still dark. I let Jet out of the tent for a sniff etc and set about breakfast. Having mixed the porridge with the bit of milk I was carrying, disaster! The ciggy lighter would not work. So not only did Jet have his biscuits but he also lapped up the porridge flakes and milk with relish. I was left with cold water and more flapjack! I crossed the streams and followed wet deer tracks most of the way across the 2k to the Mam Barrisdale path at around the 400m contour. We saw several groups of deer – Jet was fascinated. He normally runs a mile when he sees cattle or horses. Here he just stared and sniffed the air. Going around one small crag we came face to face with a solo stag. He promptly turned and trotted away. We followed but he soon disappeared from view. It was 10am by the time we reached the cairn at the top of Mam Barrisdale. We had been at the same point 20 hours earlier. 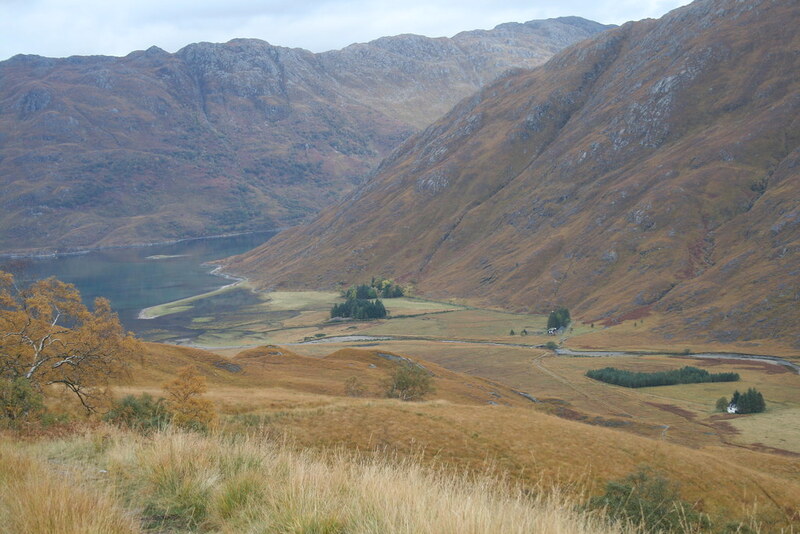 I did have the choice now of descending to Barisdale and walking out – perhaps 5 hours to Kinloch Hourn. That was not such a silly idea. I was due back at work in Yorkshire for meetings the following morning. But such a decision was never really on. It was such a fine day. 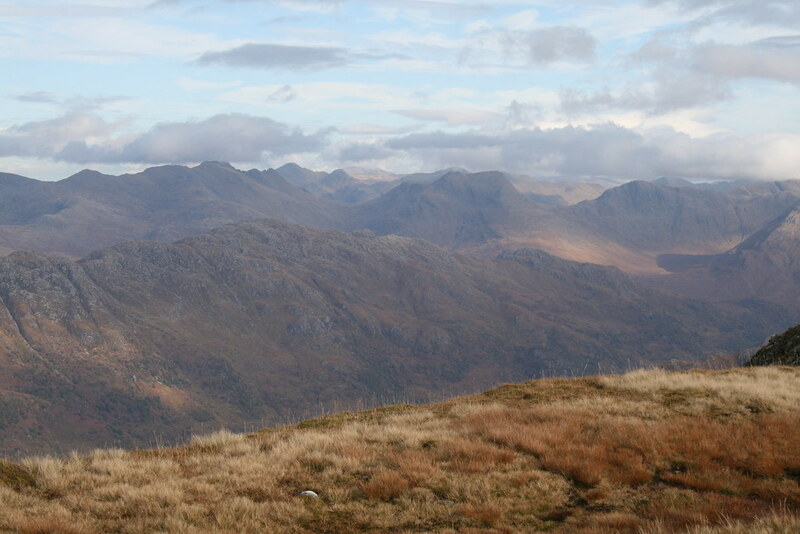 How many such days do you get in October in Knoydart? was pleasant in the sun. The sun still held some warmth but the air held the signs of winter. Although I was trying to keep fluid intake up, I still felt thirsty even after downing ½l of water. And in a sign that was not good, I was not feeling that hungry. After ½ hour we moved on. The climb up to the 805m col I found to be hard work. By the end I was having to stop to rest every couple of minutes. Jet looked back at me wondering why I was not following. But eventually the col arrived and with it some stupendous views. Wow! A short easy angled climb brought us to point 849. The ridge ahead to Ladhair Bheinn is over 2k in length and there are some significant ups and downs leading to a further 340m or so of ascent. I had previously done this route in reverse. I remembered the ups and downs but not the scrambling. A word of warning for those with dogs – there are a few tricky places where a dog is likely to require help to get over or around obstacles. Jet is quite adept at this but there were three places where he needed help and two where he looked decidedly unhappy. The route is airy and brilliant. 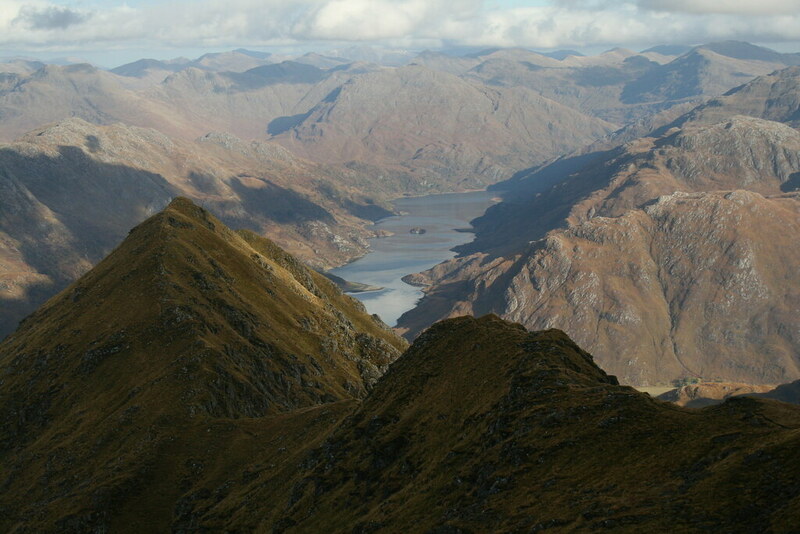 Views either side to Loch Hourn to the north and the southern Knoydart peninsula and the sea on the other side were stunning. 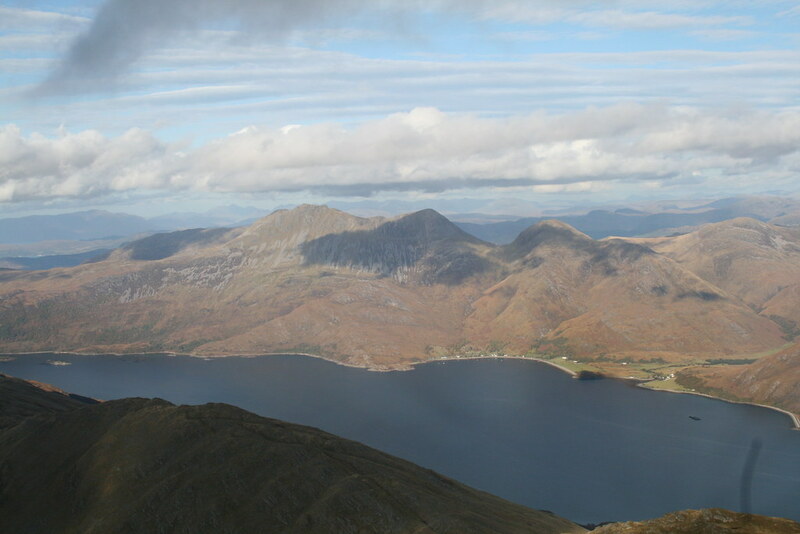 Poor old Skye and Rum were enveloped in cloud as were Sgurr nan Ciche and Sgurr Mor from time to time. As is often the case the seaboard seemed to be having the best of the weather. I had greedily hoped to have the mountain to myself. But from the col just beyond point 858 I made out a figure at the point where the ridge from Stob a’Choire Odhair joins. By the time I reached that point it was 2.15pm. The figure had disappeared from view, but as I reached the cairned summit I saw in fact two people at or approaching the trig point further along the ridge. The previous time I had been to the top of Ladhair Bheinn the top had also been clear and I had gone to the trig point – which is probably the better viewpoint. I was too tired to bother this time. I flopped next to the cairn and took off the heavy pack. Jet usually stops at cairns to wait for me. I like to think he is just waiting for me to catch up, but I suspect he knows that the area around cairns is a good spot to scavenge for food. Having made the effort to reach this point, I was reluctant to move on quickly. But I was also conscious that I was still a long way from the road head and even further from Yorkshire. I tried to work out some timings – 6 hours to Kinloch Hourn, 1 hour to Invergarry, ½ hour to Fort William, 5½ hours home. OK that would give me about 4 hours sleep at home perhaps. I could survive on that. I did not eat much but I drank to ease the thirst. I just sat and sat wondering at the views. The twosome had disappeared. I had the mountain to myself. I imagined that I was here alone with not a soul within miles or hours of where I was sitting. The sun shone. The breeze was chill. I needed to go. 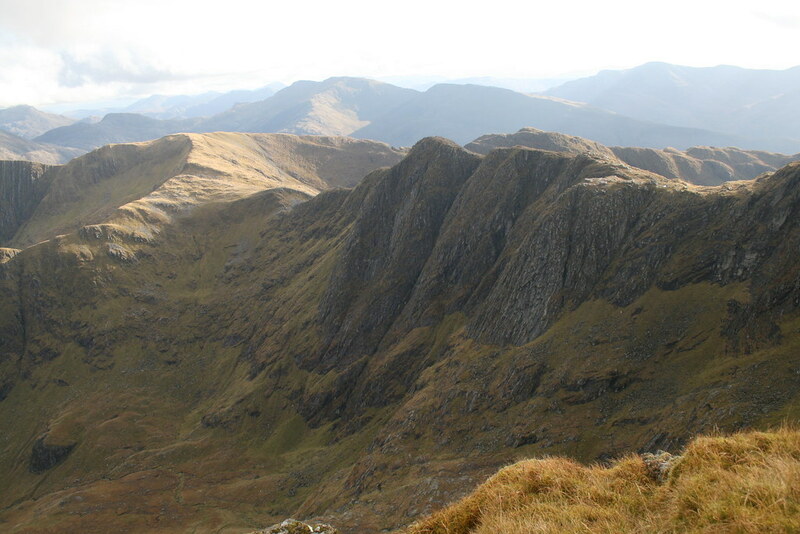 After 30 minutes on the summit, I left at 2.45pm and turned north down the ridge to Stob a’Choire Odhair. It is pleasingly narrow, a bit loose in places with a few small steps to navigate. 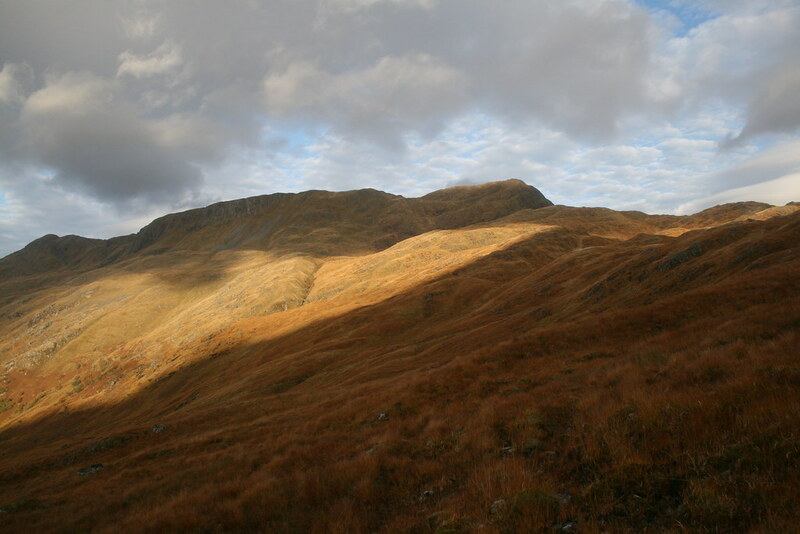 The ridge rears up to the Munro top. A few large rocks had me groaning (and moaning) with the effort to surmount them. Had this been the beginning of the day I am sure that I would have skipped up them. After this top the ridge then begins its long, long drop. There is a path. At the 700m contour ring the path changes direction and goes east. I wearily made my way down. Soon after this point, as the hillside steepens, the path becomes indistinct. If it carries on, then I lost it. By now I could see the end of the stalker’s path into Coire Dhorracail. But the ground was tussocky and uneven and wet. At one point a foot slipped and I fell but the pack on my back cushioned the impact (one advantage I guess!). 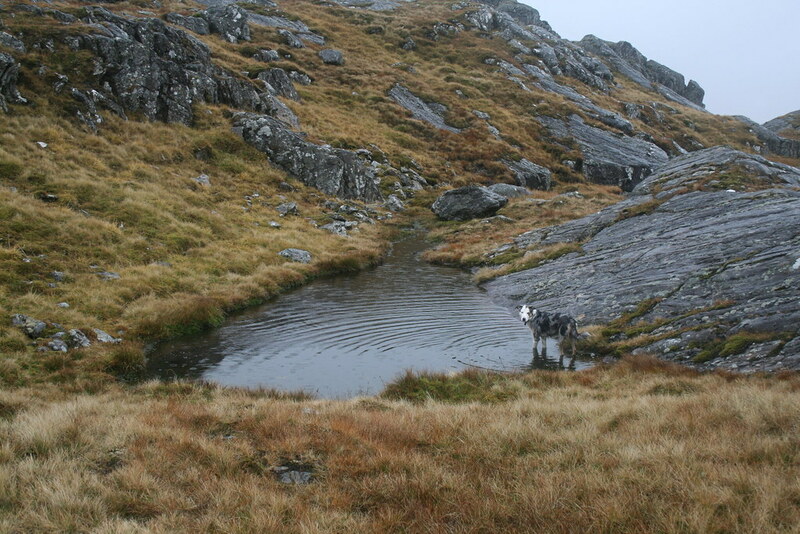 I splashed my way across the coire in a bee line towards the end of the stalker’s path. The river was not difficult to cross. As I had run out of water I refilled my bottle and had another long drink. I could not seem to get rid of that thirst. To begin with the path was disappointingly wet. But it improved fairly quickly. And the walk through birch and alder was beautiful. The sun was now low in the sky, highlighting the autumnal colours. 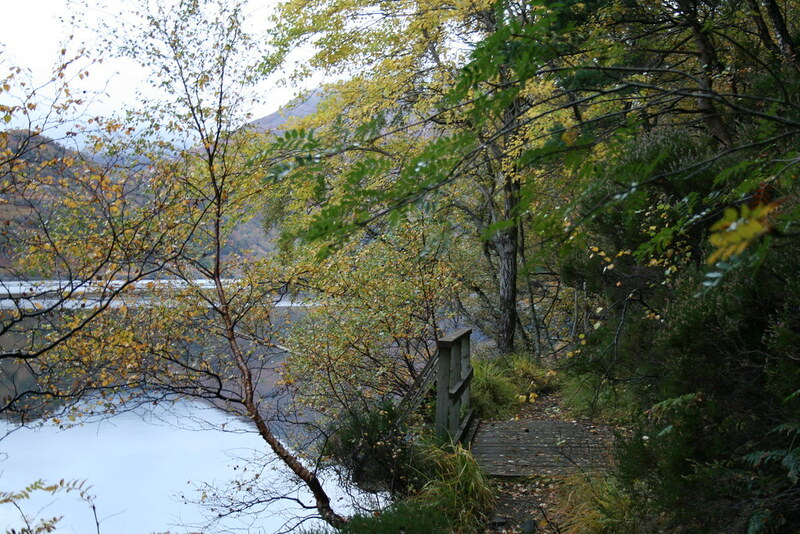 The path passes above a gorge before rising and swinging over the end of Creag Bheithe. The path then deteriorates (possibly because it is now back on Barisdale Estate land?) before descending a series of switch backs. This section was heavily overgrown with bracken which both made seeing where to go difficult and tangled around my ankles – which did not help my humour at that time. The path then swings away from what appears to be the right direction. But it leads to a crossing point over a stream near a sheepfold. The crossing was easy but made for an excuse for another brief stop for a drink. At low tide (which it was when I was there) it is possible apparently to cross the sand at the head of the Bay as a short cut, provided the rivers are low enough. I was not going to risk that. From that point the path continues south eastwards across marshy land but, as there is evidence vehicular use, the way is relatively firm. I proceeded with grim determination back to the bridge over the River Barrisdale and turned left over the bridge, past the Bothy and stalker’s cottage and the long mile past the Lodge to the junction with the coastal path. It was now almost dark. I took off my pack and sat on it. The day was perfectly still. There was barely a breath of wind. More cries of waterfowl occasionally echoed; stags continued to roar. The Loch was flat. 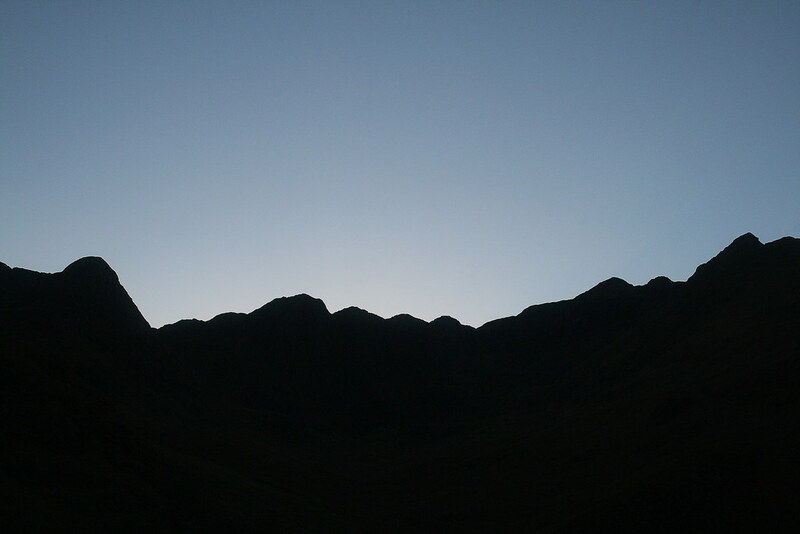 The silhouette of Ladhar Bheinn rose up to my left, the ups and downs of the ridge we had been on earlier etched against the dark blue of the sky. 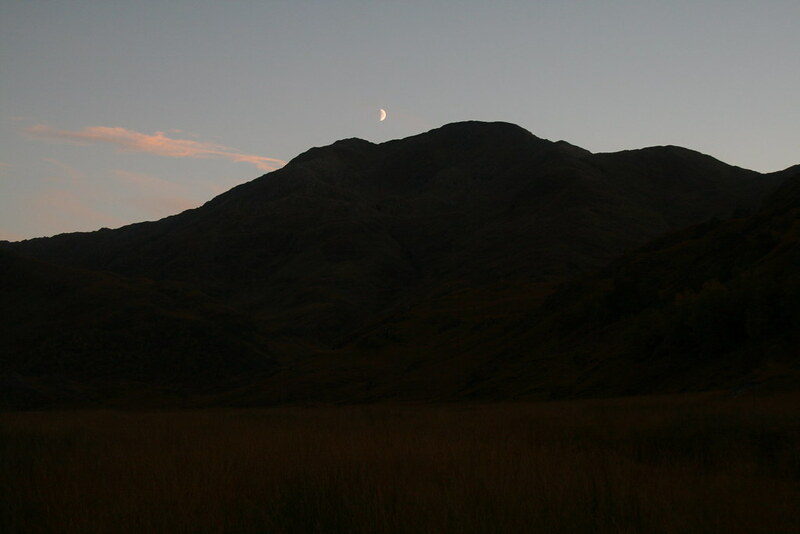 Stars twinkled and the moon was rising over Luinne Bheinn. Some lingering orange light from the sun was reflected on the water away ahead of me. It was stunning, but I found it difficult to enjoy. 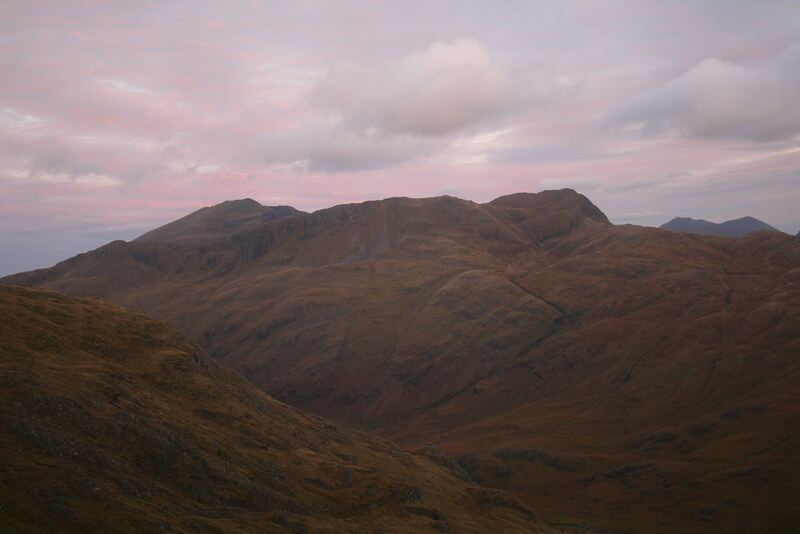 I was whacked and not looking forward to the walk to Kinloch Hourn in the dark. And then Jet came bounding up to me with a stick in his mouth and dropped it at my feet. “Please throw it for me”. I almost cried. I put on my head torch. There is little that I can say about the return along the Loch. It was interminable after such a long day. My legs were dead, my feet sore, my mouth parched. I felt rather than saw the presence of the Loch. The ups and downs seemed longer, the loose stones on the path treacherous, the brief level sections a relief. 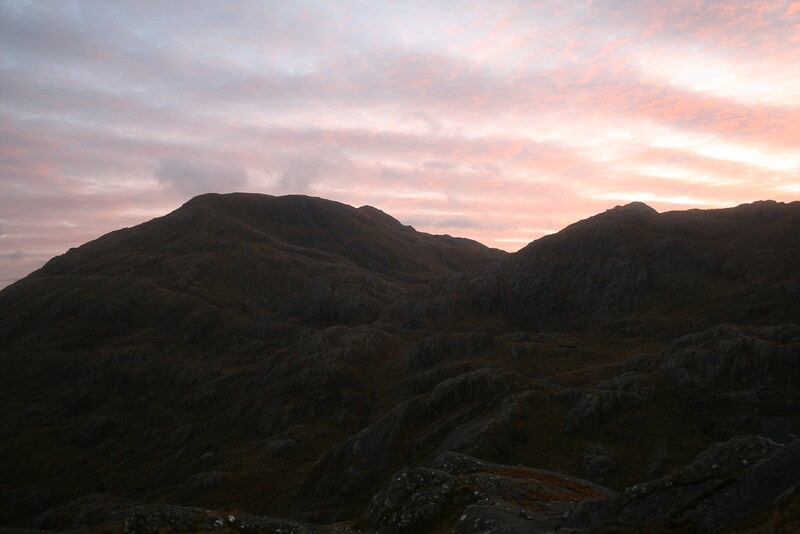 I eventually reached my car at 11.05pm – probably 2 hours later than I had estimated at the top of Ladhar Bheinn. All I had to do now was to get to work for 9.00am – was that going to be possible? 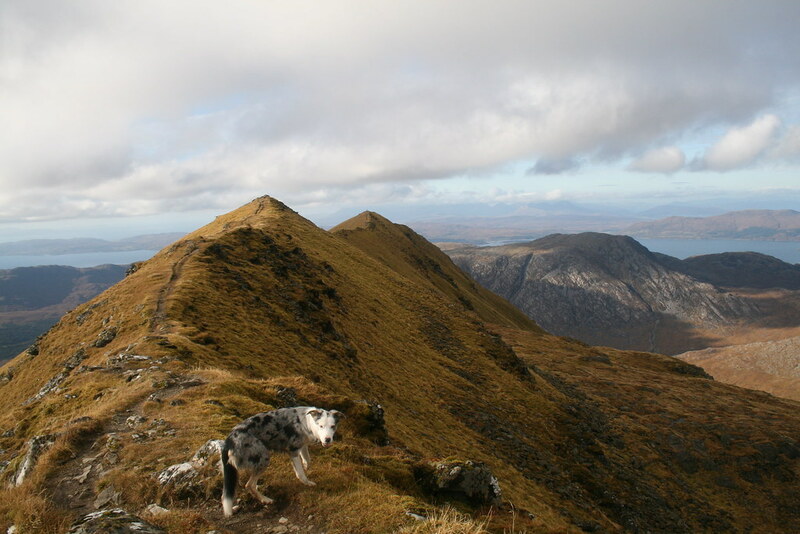 I had forgotten exactly how rough the ground in Knoydart is, so underestimated the time taken to achieve certain objectives on occasion, not helped by the heavier than usual weight being carried (including all those dog biscuits!). I obviously got myself dehydrated on the first day, but still do not fully understand why I was unable to rehydrate properly. The circuit would have been better with another part day, either for the walk in or the walk out, but I did not have the luxury of that time as it happens. I made my 9.30am meeting having been home to shower and change! The attached links may be of some interest.